Carla Tantillo Philibert founded the Mindful Practices team in 2006; the organization has offered innovative Social-Emotional Learning (SEL), mindfulness, and yoga programs to over 200 schools across the country. A certified yoga teacher with a master’s degree in curriculum and instruction, Carla was a founding teacher and curriculum director of a high-poverty high school in Chicago. She has taught at both the secondary and elementary levels, is the co-creator of Hip-HopYogaTM, and is a highly qualified professional development provider. 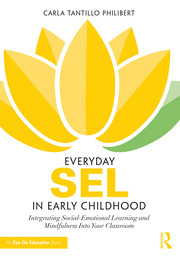 Carla is the author of Cooling Down Your Classroom: Using Yoga, Relaxation and Breathing Strategies to Help Students Learn to Keep Their Cool (2012), Everyday SEL in Early Elementary School: Integrating Social-Emotional Learning and Mindfulness Into Your Classroom (2017) Everyday SEL in Elementary School: Integrating Social-Emotional Learning and Mindfulness Into Your Classroom (2016) Everyday SEL in Middle School: Integrating Social-Emotional Learning and Mindfulness Into Your Classroom (2016), and Everyday SEL in High School: Integrating Social-Emotional Learning and Mindfulness Into Your Classroom (2017). Carla is a leader in Social Emotional Learning, Yoga and Mindfulness in schools. She has worked with educators from California to Maine, Bulgaria to India and presented to the United Nations. What sets Carla and her organization, Mindful Practices, apart is that her strategies are practical, ready-to-use and easy to adapt for the needs of each school and student served. Carla and her husband Rob are proud parents to Dottie and Remi, and they enjoy long adventure walks with their kids around downtown Chicago.